This is easy to use, easy to apply and okay drying (4-5 minutes a coat). 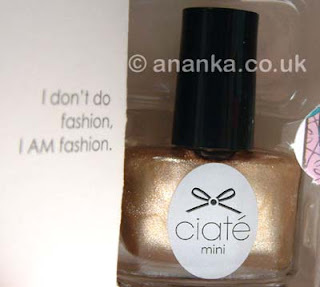 It's a nice gold foil-like polish that is really shiny! It looks quite festive I think! Lasted really well. Ooh this one is pretty! You're right, it looks perfect for a party!! 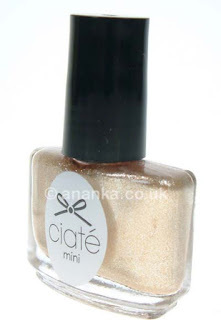 I like this "cold" kind of gold shade - it's very pretty! Wow, that's a pretty shiny cool gold :o). Really nice gold, is it the photos or I see there also a little silver bits? Now that is a pretty polish!! Love seeing all these posts from the mini mani manor! I picked up a prior year's version at a discount store here (mini mani month in blue knit design box). i really like the foil finish to this one! love how there's no brush strokes!